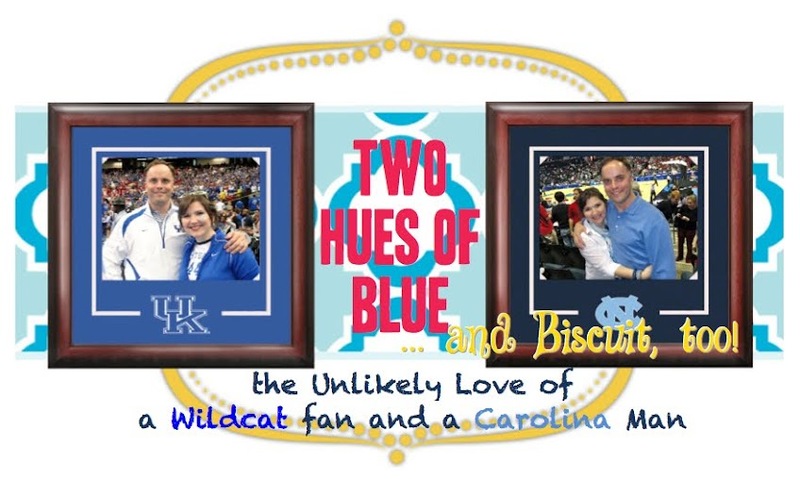 Two Hues of Blue ... and Biscuit, too! Guess which hue of blue won THIS game! I try to only post entries that have some sort of a point. I apologize in advance that this one won't. Instead, it's a story. It's a story of how, 16 months into marriage (and 4 months into parenthood! ), I was reminded that I had met my match. Our first Valentine's Day as a couple was in 2011 - two weeks after we'd first met. Jeremy came to Greenville from Canton. He brought a bouquet of flowers his mother'd arranged, and I wore a dress that I'll never fit into again. I even painted my nails, which I next to NEVER do. After a carriage ride through downtown, we listened to the piano man at the Poinsett Hotel and then walked to dinner at a (now-defunct) Brazilian steakhouse. It was a perfectly nice, if one-size-fits-all kind of date. It was enough, however, for me to know I wanted to keep this man around for at least another date. He looks so cute in baby blue. Fast forward to Valentine's Day 2013. For a week or so, we'd both been hemming and hawing about what to get the other - "what do you want?" "I don't know. What do YOU want?" kinds of conversations were commonplace. I mentioned tickets to George Strait's farewell concert in Greenville; he tossed out a day at the lake or dinner at his cousin's restaurant. Nothing, however, was set in stone, until this past Tuesday. That was the day after I'd gotten confirmation that I'd have tickets to take him to Chapel Hill to watch his 'heels play Florida State. I LOVE Chapel Hill. He LOVES the Tarheels, and we both love traveling, so it's a PERFECT surprise for a man who deserves no shortage of perfect surprises. Inwardly, I was gloating at how good my present was gonna be compared to the box of chocolates I figured he'd end up getting me. I couldn't wait to for the tickets to drop out of his card; I was so excited to piously say, "Oh, sweetie! Your gift to me is MORE than enough. I LOVE Reese's. I may even eat both Cups right now!" And then he came home for lunch on Tuesday. "I got your Valentine today," he gloated. Now, you should know that I am about as good at keeping surprises secret as I am at clipping my son's fingernails. That is to say, I'm not good at it AT ALL. So I saw his assertion as my moment for a blessedly early big reveal and begged him to go ahead with our exchange. He easily agreed and even offered to go first. "Well, Baby," Jeremy said, with his chest stuck out and a catbird kind of grin spread across his face. "Clear your calendar for Saturday." "Where are we going," I asked, assuming he'd say something like, "Out to dinner" and KNOWING his gift would not be NEARLY as good as mine. Instead, though, he said, "We are going to Knoxville to watch your CATS play the Vols." Jumping up and down with elation, I said, "ARE WE REALLY?!" As soon as I could calm down, I added, "Well, Baby, clear YOUR calendar for March 3!" "Where are we going?!" he replied. "We're going to Chapel Hill to watch your HEELS play the 'Noles!" THAT, my friends, is what "Two Hues of Blue" is all about, and it (and a million other things) is enough for me to know I want to keep Jeremy around, not just for another date, but for FOREVER. Happy Valentine's Day to the Sweetest Man I Know! Recently, I committed to blogging more. As soon as I did that, I started perusing OTHER blogs for inspiration. By that, I mean that I looked around, trying to find an answer to the burning question of "How in the world do these people have so much to write about?!" What I found in all my browsing is that, apparently, a key component of a successful blog is an entry that contains a description of the decor in one (or more) of the rooms in the blogger's home - complete with pictures of the process and a description of how it came to be how it came to be. But which room to feature? Since all but one of the rooms in my home are decorated in some combination of "Stuff I had in Grad School" and "Things Jeremy Collected from his Ninety Year Old Aunt," the logical choice is to post pictures of Jones's room. I fully expect a "cease & desist"
1) Select a Theme and Color Palette. Thanks to way too many years of theatre training, I can't help but approach everything as I would approach directing and / or designing a play. That means themes and color palettes that will both unify the whole room and, in turn, help me narrow down my choices in the design process. You'll see what I mean, as this post goes on. For me, the theme came easily. My husband is a lifelong golfer, and though our "Robert Jones" was named after Jeremy and my great grandfather, a Masters theme seemed a logical choice for a little boy who shares a name with the founder of Augusta National. 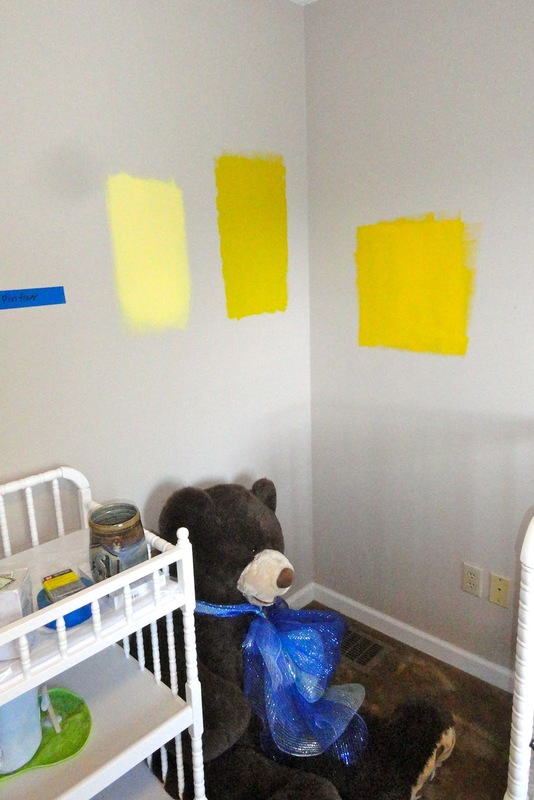 Significantly less easy, though, was selecting a shade of yellow paint. Not that anything's wrong with either, I didn't want Big Bird, nor did I want John Deere, so we tried out several shades and finally ended up with something we could both live with. More specifically, we ended up with FIVE COATS of something we could both live with. Thank God for very helpful in-laws with very sturdy upper body strength. Using this palatte, we were also able to come up with a couple swatches of coordinating fabrics, including my favorite - green fabric with white polka dots that I tell myself are actually golf balls, though they clearly are not. thought it'd be to find Jenny Lind. We had to order it online. 2) Pick Your Furniture. This was easy, too. I've always loved the classic (inexpensive!) 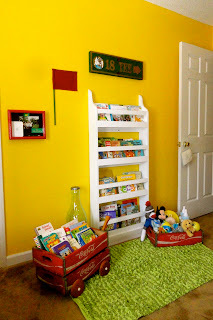 simplicity of Jenny Lind nursery furniture. I went with white (you can get Jenny Lind in oak and black, as well), because it's the same color as the cabins on the course at Augusta (see what I mean about the theme?!). Jones's room is really small - 10'X10'. As a result, I knew we didn't have room for a lot of furniture, so I just got the crib and a changing table. I also knew, however, that I wanted my baby to love books as much as his mama does. Enter this book rack, designed by Ana White and built by my super-handy father-in-law ... as soon as he put down his over-worked paint brush. of my friend Leslie's existence. Furniture-wise, all that was missing was a rocker. The original plan was to go with a white, wooden one. And then I walked down into the basement. And then I saw not one but two of the cutest (if I do say so myself), retro, BRIGHT YELLOW, circa-1960s swivel chairs. Thank you, Jeremy's ninety year-old aunt. I will grant you this: that IS a LOT of yellow. Before I discovered this cache of random rockers, I'd never considered putting two in Jones's room. Now that they're both in there, though, I can't tell you how glad I am that they are. Every nite, Jeremy and I each sit in our own, one feeding Jones his bedtime bottle and the other reading to him his nitely Bible story. It's turned into a really special, completely unexpected little "family time" that I totally look forward to every day. These were just solid bins. green & white ribbon to them. as I am capable of being. 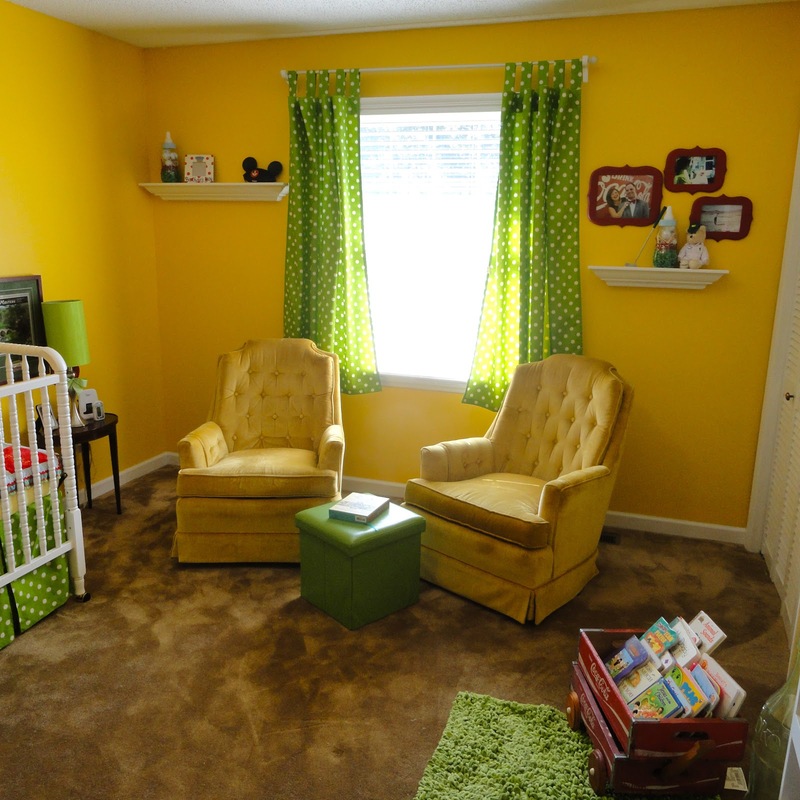 That's really all the furniture in his room: a crib, a changing table, two rockers, a small ottoman (Hobby Lobby!) and a small side-table that holds his monitor, a lamp, and a picture of the Greatest Woman Who Ever Lived (that would be my Mayme). There's a chest of drawers in his closet, but I store most of his clothes and other extras (sheets, blankets, diapers, etc.) in bins (Hobby Lobby! Or was it Old Time Pottery, Mom?) that fit in his changing table. This is SUPREMELY convenient. Annnnnnd ... now, I'm thirsty. 3) Accent-uate the Positive. They say that "the fun is in the finishing." Don't they? Regardless, that was MY favorite part. To keep costs down, we used a lot of things we had around the house - Jeremy had a couple of framed collectibles from some of his trips to the Masters, so they're in there. There are also pictures of Jeremy as a baby, as well as one of the ORIGINAL "Jones," Philip Jones Leslie. Two of my favorite things are his Coke crate toy bins, uncovered at an antique store here in Asheville, and his bedspread. This was the biggest splurge of the entire room. I mailed a lady on Etsy some of our fabrics, and she made this, and I am crippled by its cuteness. AND WE DO NOT EVEN USE IT. We went with the generic "Pressley"
like to not use this blanket, too! But we WILL use it, right? When he gets bigger, and I'm not too paranoid to put a blanket in his crib, we WILL use this. Surely? If not, I'mma make a tablecloth out of it. Or a wallhanging. Anything to prove that Jeremy wasn't right when he said that we would not even use it. Add in some curtains my mother-in-law made, a floor full of toys he's still too small to play with, and the obligatory name in letters over his crib (I wish I could've come up with something more creative, but, on the up side, if we ever forget the name of the little chap who's taken up residence in our guest room, it provides a nice reminder), and you've got yourself a golf-themed baby nursery. And, gratefully, there's not ONE piece of the "Stuff I Had in Grad School." SparklyGreenEarings4 from Big Mama on Vimeo. First, I'm gonna have to add Sparkly Green Earrings to the ever-growing stack of books I'm too tired to read, and secondly, she and I had delivery room experiences that were to-o-tooooo-tally different. According to the narration in the video, she thought "I'll never forget the way I felt when they placed [my daughter, Caroline] in my arms for the first time." my hair looks like I just stepped out of a steam room. In the same moment with Jones, I was thinking something more along the lines of, "That was SO much harder than I thought it'd be. SO. MUCH. HARDER. No, really, Son. I hope that, some day, I can forget how hard that was, so that you and I can be buddies, but right now, I'll be honest, I'm a little put off by how hard that was. My sister did that FOUR TIMES?! In the name of Heaven, HOW?!" They say to visualize something to make childbirth easier. In the critical moment, all I could visualize was a two hundred year old tree trunk passing through a string cheese. That's not the politically correct thing to say. It's true, though. The transcendent, euphoric, nobody-but-me-and-my-baby-in-this-bubble-of-love experience I expected didn't come until later, like after the Lortab kicked in and I'd had some lunch. The experience did eventually come, though. In fact, I have it about six times a day when the baby boy with his daddy's eyes and his mama's cheeks squeals with delight because I've walked into view. And I, like Melanie, wish I could somehow save each and every squeal. I'd bottle it up and store it away for those days when motherhood is "SO. MUCH. HARDER" than I thought it'd be. I wish MY legs were that skinny. 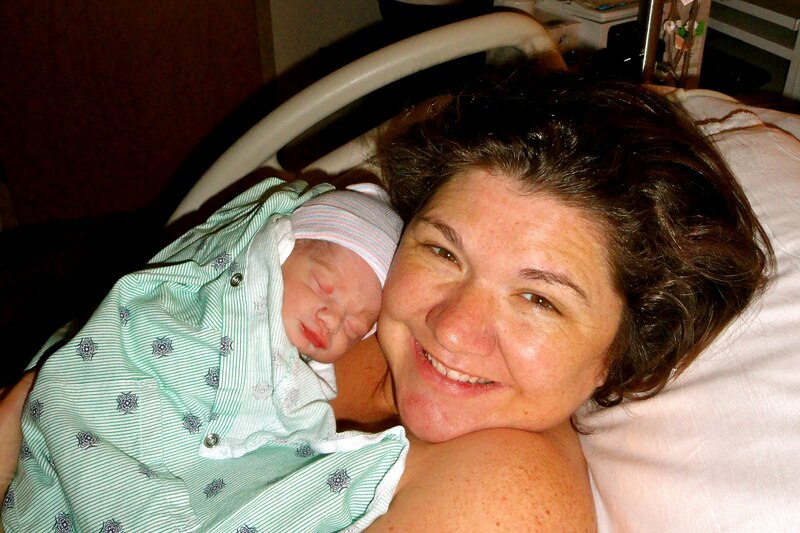 Because I developed pre-eclampsia at the end of my pregnancy, Jones was delivered three weeks before his due date. At that point, he wasn't interested in eating anything, much less having to work for it, so in those early days of force feeding him through a syringe, I committed myself to six months of giving my sweet little man breast milk in bottle form, which, in essence, has amounted to "expressing myself" multiple times a day like some kind of dairy animal who's been removed from the farm. Trust me. There IS a point to all this. For the most part, pumping has been a pretty easy experience. I'm so thankful to be able to give Jones the health benefits of breast milk, while at the same time giving myself the convenience of, say, having his daddy give Jones his breakfast bottle. In fact, the only time pumping really presents a problem is when mealtime hits, and I haven't yet ... oh, how should I say this? ... "prepared" it. I KNOW he eats at 4:30. This happens every, single day, but today, for whatever reason (ahem, Facebook), I wasn't ready. Minutes before zero hour, I snuck out of Jones's room, where I'd stepped in to check on him. Since he'd just started to stir from his nap, I thought I had time. Well, no sooner had I gotten connected to my "equipment" then my very sweet-natured son started to let me know, so to speak, that I was late with his lunch. What could I do? I couldn't feed him what I hadn't yet produced, so I pumped on. As I sat there, I thought to myself, "If he only knew what I'm doing in here ... if he only knew, he could quit the crying, knowing that I'm preparing right now to meet his need." As the thought sunk in, I could sense God saying to me, "Exactly." If only I'd known about the UGA acceptance, I wouldn't have cried through three years of applying to doctoral programs. If I'd had any idea that Jeremy was waiting, I wouldn't have fought Him so hard for leaving me single so long. If I'd known in advance what He was up to in these and so many other situations, I could've just sat back and let Him do His job. Instead, I cried and complained, like my three month old son, sweating out whether or not I'd remember to feed him. But the truth is, I DO know what He's up to. He tells me in Romans 8:28. He's working all things together for my good. Even when I don't know what He's doing. Even when I'm crying my eyes out. Even when I think He's forgotten to feed me. He's always there, preparing right now to meet my need. A Double Shot of "AWESOME"
Who out there wants to stop being boring? For you - and for me - I give you this little pep talk ... because if there really ARE two paths, I ALSO want to be on the one that leads to Awesome. Do you ever have those moments in your life when you just take a deep breath and wonder, "What did I do to be so blessed?!" These moments in my life have been many. God has been beyond good to me, doing, as He promised, "exceedingly, abundantly more than I could ask or think." Precious husband. Healthy son. Passion for the Winningest Team in College Basketball History. If you ask me, I've got everything I need! One of these "Wow!" moments came last spring in the form of an invitation to speak before each musical in the 2012-2013 Certus Broadway Series at the Peace Center in Greenville. When offered the gig, I had to clarify before accepting. "Hold up," I said. "You're telling me I get to prepare and present a chat about musical theatre to people who choose to be there? AND THERE'S NO GRADING INVOLVED?!" The theatre professor in me has achieved Utopia. I say all that to say, we'd love to see you there! The talks are held at 6:30 p.m. on the Wednesday nite of each show's run, and the public is welcome whether or not they're planning to attend the show. So join us: next up this season is Billy Elliott (Feb. 13), followed by The Blue Man Group (May 8), and, Daddy's favorite, Jersey Boys (July 17). Each session is different - but it generally entails some form of historical background about the show, and, sometimes, a Q&A with members of the cast. On very rare occasions, I may even sing a bar or two of the score. I get giddy just thinking about it ... and NOT just because there's no grading involved! Jones has become a really good sleeper. Call it luck; call it training; call it months of praying before (and after!) he was born that he'd take it easy on his sleep-greedy mama, but most nites in recent weeks, we put him in his crib at 7:30 p.m. and typically don't hear from him again for another 8 or 9 hours when he wakes up to eat before dozing off once more. Truly, he is his father's son. Thanks, Leslie Bell, for my threads! Though we may not HEAR from him, that doesn't mean we don't see him. Until Jeremy and I go to bed a few hours later, we both check on Jones repeatedly. In fact, I find myself making excuses to walk by his bedroom, just so I can peek in. Want to be sure he hasn't swallowed his paci. Got to confirm he hasn't, in the middle of the nite, learned how to roll-over, leaving himself face down on his bright yellow bedsheet. Irrational fears, I grant you, but these are actual thoughts that run through the mind I inherited from my mother. Jones has no idea I'm doing this. I just do it, because I love my baby boy and want to be sure he's safe. Just after he was born, I walked in one nite and stood there, watching him sleep. One hand on the white crib railing, I used the other to pull down a piece of his sleeper that'd gotten bunched up by his tiny nose. I threw that wascally pacifier to the foot of his bed, and I stood there, periodically putting my hand gently on his belly just to be sure I could feel the rise and fall of his baby breath. Just watching, protecting in case anything came up that my newborn couldn't handle for himself. "In peace, I will both lie down and sleep, for You Alone, o Lord, make me dwell in safety." "In other words," God seemed to say to me, "This is how I watch over YOU, Kristin." Only, He's ALWAYS there, never slumbering or sleeping, keeping a constant watch for those countless things I can't handle for myself (can I handle ANYTHING by myself? Um, no). He Alone protects me from things that I - just like Jones - don't even know are hazards, because He loves his little girl and wants to be sure I'm safe. Follower of Christ, Wife of Jeremy, Mama of Jones (and, come 1/14, Freddie! ), Fan of U.K., and Professor of Theatre. Life is good; God is greater!